1.Soak rice in water for 30 minutes. 2.Mash panner.Add salt,red chilli powder and cornflour.Mix well and make small balls of the mixture.Heat oil in a pan and deep fry the panner balls to a light brown colour.Remove and keep aside. 3.Heat oil in a pan.Add the whole spices and saute till they crackle.Add sliced onions and stir fry in golden brown.Add ginger garlic paste dissolved in water. 4.Add salt,juice of half lemon and sufficient water. 5.When water starts boiling add rice and cook on a medium heat,stirring occasionally. 6.When the water is reduced to the level of the rice,sprinkle milk on the top.Cover with wet cloth and cook on a low heat until the rice is well cooked. 7.Remove from heat and serve hot,garnished with fried cottage cheese balls. PS:-Quantity of water depends on the rice,i took 1 1/2 cup water for 1 cup of rice. Nice idea of making paneer balls sarith those balls loks so cute and delicious paneer pulao recipe yum. i love the idea of adding paneer in this form..looks yumm..
Wow , iam drooling..new to me..LOoks superb!! 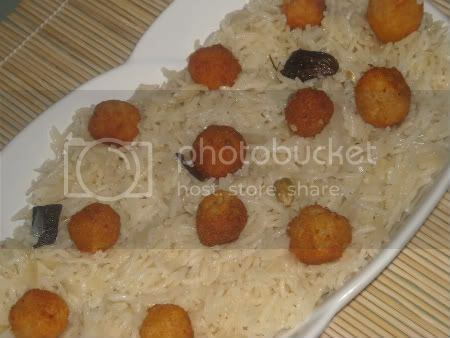 Wow am just drooling over the rice rite now...Such a gorgeous dish.. I have neve rmade pulao with paneer, sure goingto try once. Very creative. Just drooling over the rice, looks yummy. Love the cute paneer balls in the pulao..my kids would love this! This dish looks really inviting and sounds yummy! Looks very delicious, can have it now.